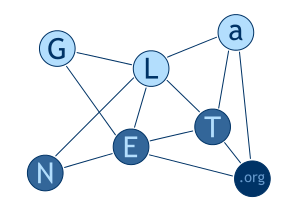 GLaNET is a dynamic partial mesh network made of the interconnection of multiple private networks using OpenVPN, DMVPN or basic IPSec/GRE links with BGP routing. Its purpose is to offer services to its users, experimentation playground, and whatever comes to our disturbed minds. September 2009: Project launch by Romain Boissat (AS64544) and Benjamin Collet (AS64542). September 2009 to December 2010: Initial experimentations. 24 December 2010: the project receives its final name: GLaNET, a portmanteau of GLaDOS and network. 8 March 2012: GLaNET gets his own domain and website. 20 July 2012: GLaNET has its first virtual exchange point: Caribou. Its located in Quebec, Canada and allows clients in Europe and northern America to easily peer. This virtual exchange point also provide a route server running BIRD. 17 October 2012: Johan Fleury (AS64545) joined GLaNET. 23 October 2012: Guillaume Mazoyer (AS64546) joined GLaNET. 1 May 2013: Benoit Petit (AS64547) joined GLaNET. 11 December 2013: David Boissat (AS64548) joined GLaNET. 13 February 2014: GLaNET has a new logo, thanks to Romain Boissat. 25 August 2015: Antoine Ténart (AS64550) joined GLaNET. 15 March 2016: First native IPv6 IPSec tunnel, between AS64542 (Benjamin Collet) and AS64546 (Guillaume Mazoyer). 28 April 2016: AS64542 (Benjamin Collet) now uses public ASN 202945 and IPv6 PA addresses. 18 August 2018: AS64546 (Guillaume Mazoyer) now uses public ASN 201281 and IPv6 PI addresses.